Walking to the Brown Line Station each Sunday after visiting my mother, I walk by a back yard that has its long side open to the street behind a chain link fence. Sometimes, in the green lawned spring or frigid snow of winter, I would see a small dog in that yard. Unlike pretty much any other dog I've ever encountered, it would never bark. Year after year, never. Once or twice she'd come closer to the fence when I said hello. Sometimes she'd cast a quick glance at me from what I saw as sad eyes. I wondered, not too deeply, about her life, and about the people who owned her, and whether her subdued presence spoke of a less than happy life. And then a couple weeks ago I found on the fence what you see in the above photo. There is so much cruelty in the world. Behind every unknown door, down avoided streets, across the hidden half of the world, you feel cruelty lurking, the common currency supporting so many of the thoughtless pleasures of our comfortable everyday lives. Cruelty, just beneath the surface, easily unseen. I admit that is what I thought of, what I feared, when I saw the little dog alone in the yard. And so, when I saw gentle Chloe's memorial, and the kind inscriptions from neighbors, I felt shame. Even more, I felt a sadness. 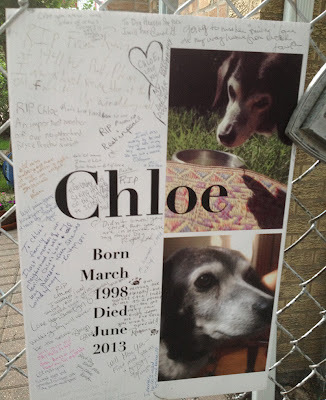 A sadness for Chloe's passing, and for slighting the possibility that the answer to a mystery could still be love. Really nicely said. Thank you. I came across your blog while researching a pair of Louis Sullivan lions. This post warmed my heart. Thank you for taking the time to share it with the world.